Carlos and Maria Fernandez-Ardavin painstakingly handcrafted this Gothic clock to mirror medieval style. The first medieval European clockmakers were monks, who learned the art of building timepieces to regulate their monastery schedules. They painstakingly crafted mechanisms that chimed on the hour and rung bells to broadcast the time. Like those early timekeeping devices, this Gothic clock relies on intricate handmade parts and attention to detail to count the hours. Father-daughter team Carlos and Maria Fernandez-Ardavin create each of their stunning designs to represent those constructed in the Middle Ages. Using only materials available during the era (no plastic here), they craft each element that goes into every clock. "On the shelves stand hundreds of drawers containing the smaller pieces," says Maria. "A great number of jars contain different types of nails, screws, nuts...etc., all waiting their turn to take their place on the clock." The authentic design uses a foliot—a metal rod with counterweights that must be balanced—and a charmingly patinaed hammer and bell. Since the minute hand didn't appear until the advent of the pendulum in the 18th century, a lone hour hand points to Roman numerals stamped in the brass dial. Like those medieval monks, you'll want to wind the clock twice daily to ensure accuracy, even if you aren't planning a long day of monkly duties. Handmade in Madrid, Spain. 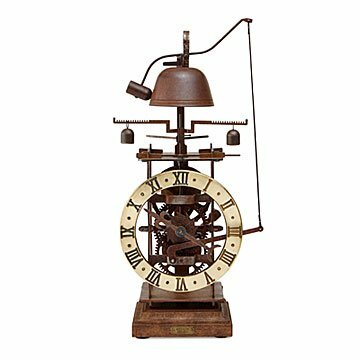 “Our story as medieval clockmakers started in 1960 when my father made his first wooden wall mounted mechanical clock,” says Maria Fernandez-Ardavin. Her dad, Carlos, was working as a manager in a furniture factory at the time. Since his background is in industrial engineering and he’s always loved mechanics, trying his hand at clockmaking wasn’t too much of a stretch. He’d made his own toys as a teenager, and was always astonishing his family by repairing things and creating fantastic inventions. After finding photos of antique clocks in an Italian history book, Carlos came up with the idea to make a model clock that would work in the same way early medieval timepieces—the first mechanical inventions to measure time. Carlos received such a positive response to his creation that he quit his job at the factory and began crafting medieval clocks full time. Eventually, he taught Maria the art, and when she graduated with a degree in archaeological restoration she joined him in his clock making business. Wind up the clock by turning the crank reverse-clockwise until the spring stops. The clock will immediately start working. To set the clock you must turn the hand clockwise.This clock strikes once every hour. This is a made-to-order item. If you order today your item will ship no later than 6/27/2019.